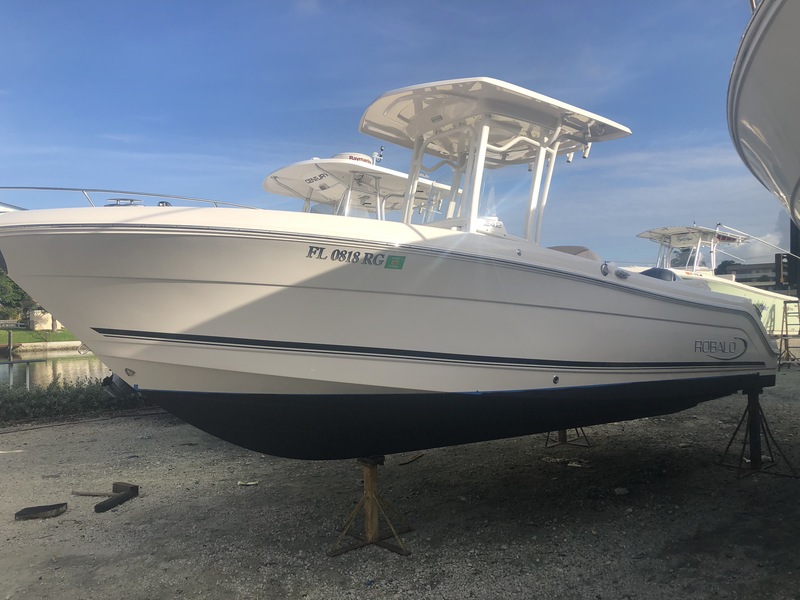 Captain Gary is the owner of a 2017 Robalo R242 center console. Gary had done extensive research on the thehulltruth.com about the best protective ceramic coating for boats and he come across Glidecoat. 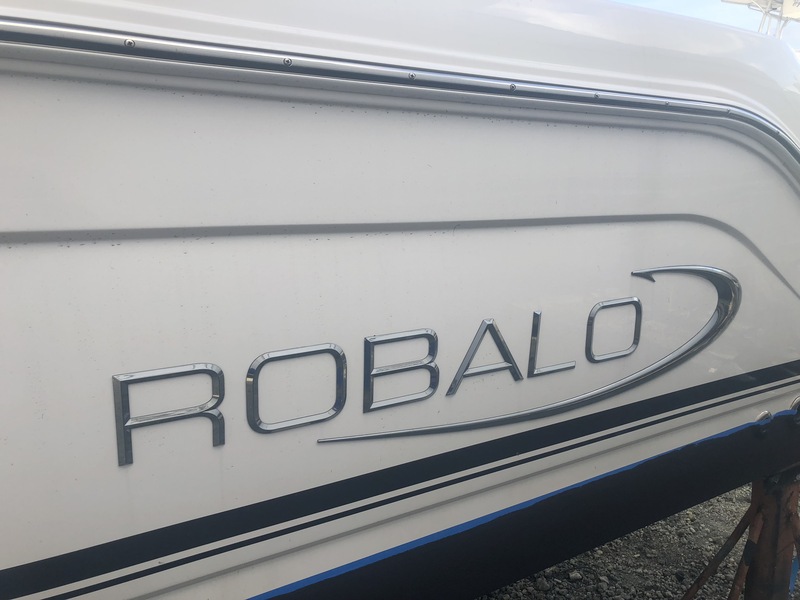 He realized the tremendous value that Glidecoat could add to his 2017 Robalo, by increasing the gloss and shine, sealing the surface to protect its integrity, and making maintenance a breeze. The results were even better than he expected! The challenge for every boat in South Florida is what is the best way to protect your boat from the extreme conditions. Boats in South Florida are subject to constant sun exposure and salt water, which takes its toll on even newer boats. 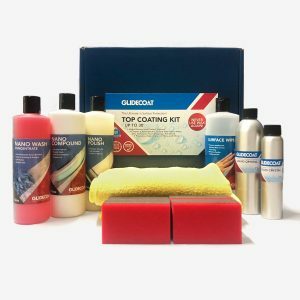 These factors make it very important for you to pick the right product to protect your investment, and Glidecoat is that product! Glidecoats Liquid Crystal ceramic coating fills in the pores of the surface, creating a hard bond, which seals and protects the surface. This allows our product to give a better than new shine to your boat while giving you far superior protection compared to a traditional wax. Before beginning our preparation and application process, we always use a Gloss Meter to measure the shine and gloss of the surface. This allows us to show numerical evidence of how well the coating works, and also how the coating is holding up over time. The initial readings on Capt. Cary’s boat ranged from 36.9 to 62.3 across different areas of the hull and topside. This also shows how quickly the shine of the surface can deteriorate when it isn’t protected, even on a newer 2017 boat. 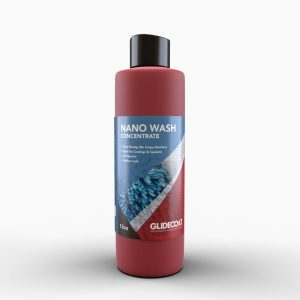 We begin the process by washing down the boat with Glidecoat’s Nano Wash, a concentrated formula, to remove any dirt and scum from the surface. Once clean, we are ready to polish. Given that the boat is only a year old and in good shape, the normal compound step was not required, so we were able to move directly into polishing the surface. We used a Makita Rotary buffer with a light cutting foam pad, and Glidecoat’s Nano Polish. This allowed us to remove all imperfections on the surface of the hull and topside without the use of aggressive compounds. 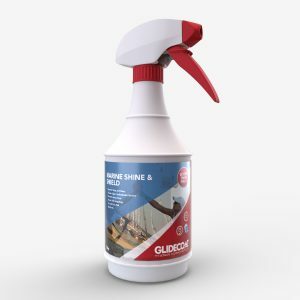 After polishing the hull and topside, we use Glidecoat’s Surface Wipe to decontaminate the surface, removing any dirt or residue before applying the final coating. 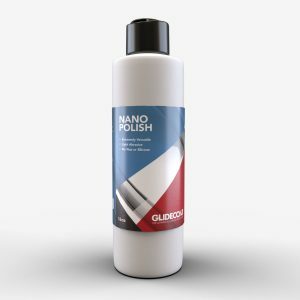 The final step in the application process is applying Glidecoat’s Liquid Crystal, a nano ceramic coating. When applying the coating we work in small 2’ by 2’ sections, applying a dime sized amount of coating in the middle of the application sponge, then working the sponge across the entire area to be coated. Once applied, the surface will appear to be sweating. Immediately after applying we hand buff the area with a microfiber cloth, working the coating into the pores while removing any excess from the surface, followed by a second clean microfiber to ensure a smooth consistent finish. Once we completed the first coat of Glidecoat’s Liquid Crystal, we come back across all areas and applied a second coat. The purpose for two coats is to ensure complete coverage and protection. The first coat acts as a primer, filling in deep pores, while the second coat acts as the sealer to provide ultimate protection. Gloss meter reading of gel coat before the Glidecoat Application process. 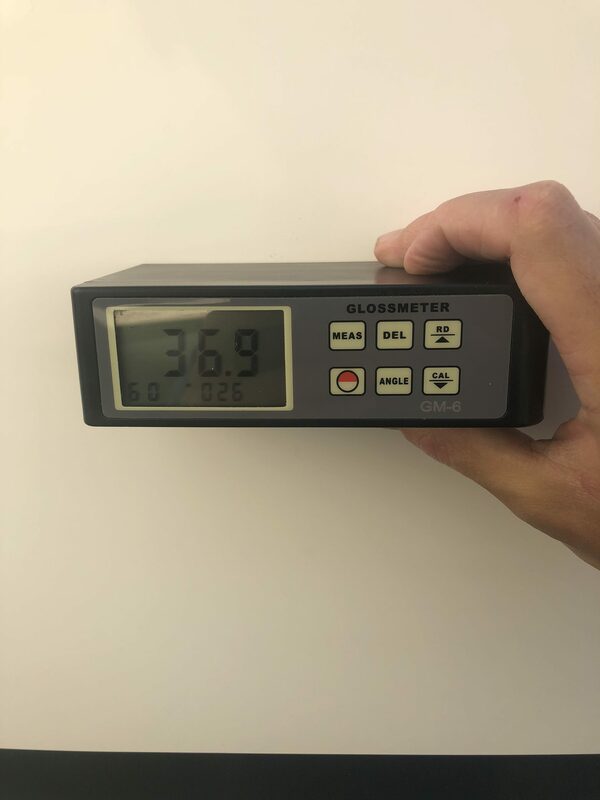 Gloss meter reading after applying Glidecoat Liquid Crystal! Improving the gloss of brand new gel coat by 15%. After completing the entire boat, Captain Gary couldn’t believe the results! 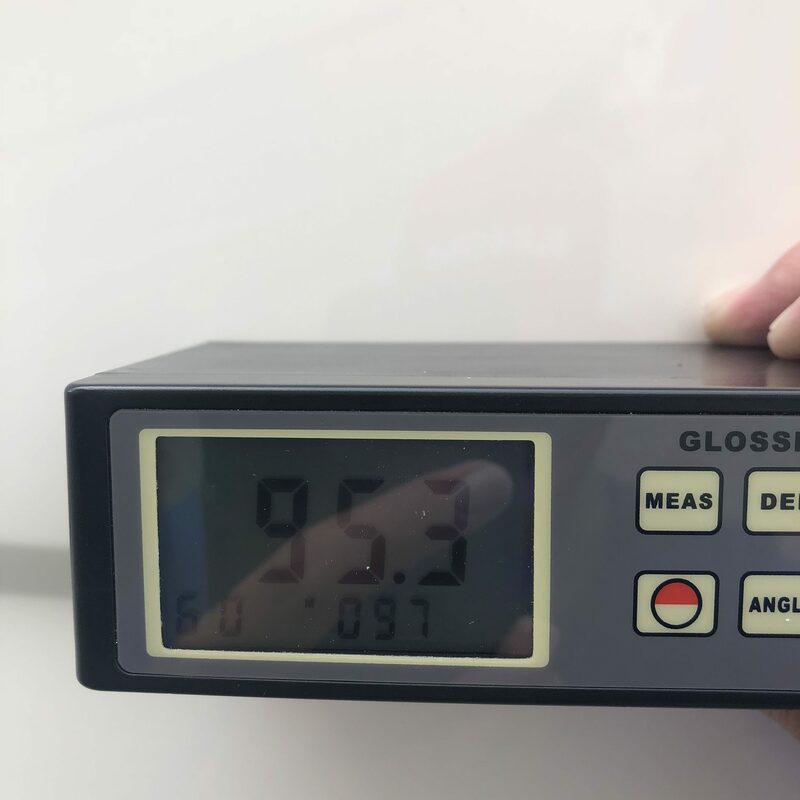 We were able to take the gloss meter readings from a measly 62.9 to an amazing 95.3, which is over 15% higher then a factory new boat. While the shine and gloss of the surface is important, the protection our coating provides is far more important. 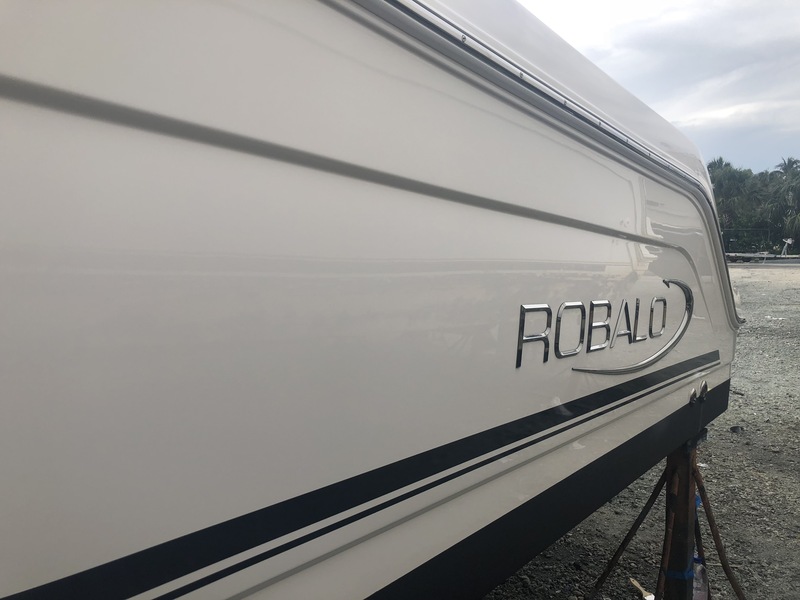 This gives the owner the peace of mind that his investment is protected, allowing ease of maintenance so he can enjoy more time on the boat without the constant hassle of cleaning. After the application the surface was spotless, having that deep gloss and reflection that's even better than new!